India is at the cusp of a digital revolution that promises to bring in transformative impact among low-income populations by bringing the unbanked into the fold of formal finance. Yet, financial inclusion needs to bridge gender gaps for it to become truly inclusive and India still has a long way to go in this regard. 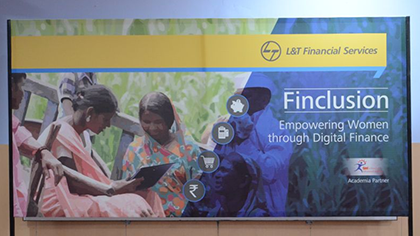 L&T Financial Services and Sattva took a bold first step towards the goal of digital financial inclusion of women in rural India through the conception of Finclusion: Empowering Women through Digital Finance –a whitepaper that tells the story of the rapidly growing digital ﬁnancial landscape in India, and how focusing on rural women for digital ﬁnancial inclusion beneﬁts them, their families, their communities, and the ecosystem at large. The whitepaper explores challenges and barriers faced by women in accessing digital financial services, highlights the improving status of women with the emergence of digital financial inclusion initiatives, and contemplates the way forward. Click on the DOWNLOAD link on the left for the full whitepaper.